A full line of off-the-shelf products for face mounting components on a shaft, depending upon specific user design requirements, is available from Stafford Manufacturing Corp. of Wilmington, Massachusetts. 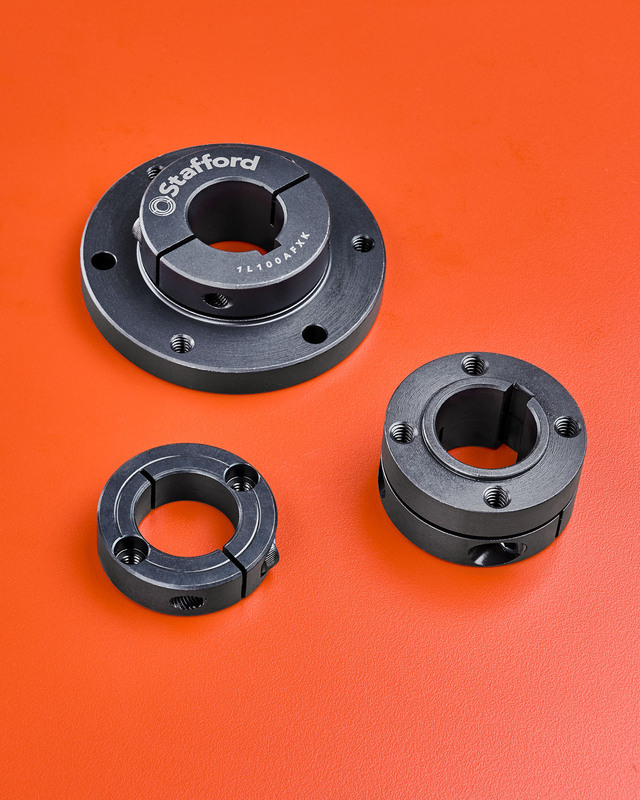 Stafford Mounting Shaft Collars include Flange Mounts with six mounting holes and a keyway plus the Accu-Clamp™ non-marring and perfectly square clamping feature for mounting a shaft, tube, or pipe to a flat surface or for attaching components to them. Additional solutions include Accu-Mount™ collars with precision locating hubs and predrilled and tapped holes, and conventional Face Mount Clamp collars with predrilled and tapped holes. Providing non-marring clamping for various face mounting applications, Stafford Mounting Shaft Collars are available made from aluminum, steel, and stainless steel in 0.25” to 3” I.D. sizes, depending upon the part. The Accu-Clamp™ Shaft Collars feature an integral clamp on one side while leaving the other flat and perpendicular within 0.001” TIR. Stafford Mounting Shaft Collars are priced according to style, size and quantity. Price quotations are available upon request and custom modifications can be accommodated. Stafford Manufacturing Corp. is a manufacturer and distributor of shaft collars, rigid shaft couplings and specialty mechanical components used in power transmission, motion control, automation, and other OEM and MRO applications in both industrial and consumer products. Founded in 1975, Stafford Manufacturing Corp. is built on commitment to quality products, superior customer service and employee development. Arthur Stafford started the company on a shoestring budget but with a clear vision of what was required to accomplish those goals. Today, after three major expansions, the founder remains at the helm – joined by several of those original employees and many of the company’s earliest customers. The commitment continues.